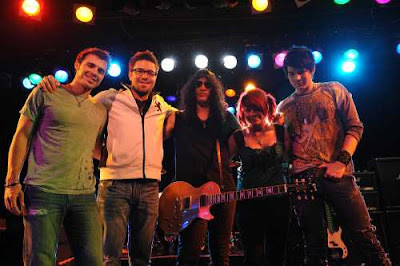 >The remaining 4 contestants on American Idol season 8 pose with this weeks mentor, Slash. This week is Rock week on American Idol and with the help of Slash the remaining contestants, Allison Iraheta, Danny Gokey, Adam Lambert and Kris Allen will try to prove once more that they deserve to be the American Idol for 2009. In case you didn’t know Slash used to Gun N’ Roses lead guitarist. He’s currently a member of a band called Velvet Revolver. Wednesday for the results show, we will have performances from No Doubt and ex-idol contestant Chris Daughtry and his band Daughtry.